At the end of the year, Felipe Massa and Ferrari will go their separate ways in racing terms, but the affection that links the Brazilian to the team with which he grew up, as a driver and a man, will always be strong. That is clear from what Felipe had to say in an interview with Andrea Cremonesi in an interview in today’s Gazzetta dello Sport, as part of the build up to the 2013 Finali Mondiali, which gets underway today and goes on until Sunday at the Mugello circuit. The event will also serve as tribute that Ferrari wishes to pay to Felipe, who as stated in the headline to this story, will always be a Ferrari man. Ten years at Ferrari, a racing life. 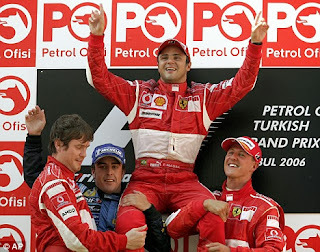 Only Michael Schumacher wore the red race suit for longer than Felipe Massa, who leaves Maranello at the end of the year. Wearing that red suit, the Brazilian came within touching distance of taking the world title in 2008, but he also almost lost his life at the 2009 Hungarian GP. Eight years as race driver: what’s the secret to staying such a long time at Ferrari? The best moment of this long adventure in red? How do you explain to a youngster joining the FDA what it means to be a Ferrari driver? After the accident in 2009, did your priorities in life change? Sebastian Vettel took his fourth title this year: are those titles more down to him or his team? “It is 100% down to him and his car. Because it’s true he drives the quickest and most consistent car. But then it’s he who manages to extract its potential, who takes pole, who puts 6 tenths over on everyone, including his team-mate! He’s a fantastic driver. Rob Smedley, his race engineer. You have had many team-mates, which was the strongest? Ferrari started 2013 strongly but then it stalled. Are you already thinking what you will do after F1? Webber has decided to race in Prototypes?